Still thinking about shirtdresses …. I've made three shirtdresses/shirtwaists so far and I have to tell you: it's NOT ENOUGH. I have three more patterns lined up and just bought this one, too (from The Sisters Five on eBay). A few things: making a shirtdress takes roughly TWICE as long as it takes me to make a dress that doesn't have thirteen buttons and buttonholes. It's not a four-hour task to make a dress any more; it's a lot like eight. Or possibly ten. And, no matter how many buttons I buy when they're on sale, I either don't have the right color, or, if I have the right color, they're not the right size, OR, if I have the right color & size, I am short THREE. (One or two, I could fake, but THREE is really impossible.) But despite all this, I am committed (or is that, I should be committed? Different "committed") to doing more of them. Like this one, which caught my eye with that fabulous color green, but kept it for the stripes (with that jaunty half-turned-up collar). I seem to have purchased quite a bit of striped fabric lately and the thought of matching them all … is not a good thought. Thus the raglan sleeves, yay! Oh, and for interfacing, especially of light cottons, I've been using silk organza, instead of any fusible stuff. You can buy it cheap at Dharma Trading, and it really works well. Nice and crisp without being crisp-y; sewing it in isn't too onerous, and it never bubbles the way cheap fusible can. I bought some Shirt-Tailor interfacing but it was just WAY too stiff for me. I only use the organza to interface the collar and the front buttonhole/button facings; I baste it in just inside the foldlines of the front facings and then zigzag over both the fabric and the organza to finish the raw edge — and it's worked out nicely, so far! Eventually I will have pictures of the three I've made, I promise. silk organza for the interfacing, hmm? I’ve a question for you about that: do you wash it before, or just steam shrink? Do you dry clean your shirtwaists, or machine wash? I’m a pretty anti-dry clean kind of gal, as long as I can get away with it, but I’ve worried about using silk organza losing some crispness if I’m going to machine wash the garment. Awesome tip about the silk organza. I am dying to see your dresses!! I just got a set of 4 patterns on ebay myself, and am wondering what fabrics to use so they’ll be cute without looking dowdy, so yours will be great to see!! Quit teasing us Erin! Post the pictures! Post the pictures! Two words for you: covered buttons. Hey, it worked for our moms and grandma’s – oh and I’ve heard about the organza interfacing, but didn’t have a good source, thanks. Careful about the green dress. I recently found some fabulous green cotton sateen which I lovingly crafted into a shirdress…only to find I looked like a fancy girl scout. I recut it into pajamas which actually, I get to wear more often. If you’re short three buttons or so, just use what you have from the bottom up and put a few different, fancy, decorative ones at the top toward the neckline, or vice versa, even! Organza’s good but if you have fusible to use up, it can be washed & preshrunk in hot water before cutting without the adhesive coming off. I love your dresses and your blog! By the way, you had mentioned Liberty of London fabric….I’m here to tell you that there’s a better cheaper place to purchase it at:http://www.knittingjenny.com/liberty.htm!!!! These are really nice incarnations of the shirtdress. I like the idea the raglan sleeves free you from having to match stripes. Plus, what a ripe opportunity for piping (that’s what I think is going on with the green dress)! I hope you have fun with this pattern. Hi, I just discovered this blog and I am just tickled pink. You see, I’ve had a thing for shirtdresses for a while now, and it’s so gratifying to see that I’m not alone. 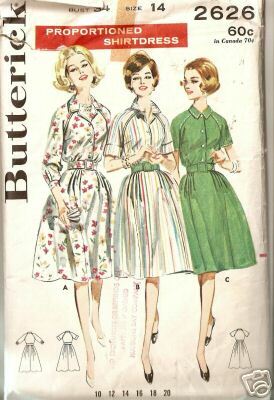 I’ve yet to complete one, although I’ve purchased a few vintage patterns. I’m REALLY looking forward to seeing the pictures of you, namely because I don’t (who does?) look like those ladies in the pattern illustrations. What does the thing look like on a real person? I’m dying to know. Thanks, and so glad I found you! Ohhhhh…such awesomeness. [sigh] I will be sending my Mom this link. I think she has a pattern very similar to yours in the pic, from around the same time period. I have purchased silk organza from Dharma too. Just don’t buy their thread; they sell coated quilting thread as regular thread. It will gunk up your tension discs if you try to machine sew with it. And yes they know and no they have no intention of changing because they say I am the only person who has a problem with it.Yay! Raglan sleeves. Cool pattern. Can’t wait to see what you make with it. I’ve been obsessing about shirt dresses for some time now; which is odd, because I haven’t worn a dress in years. For a long time, I was too fat – separates looked so much better on me – but now I’ve lost weight, whenever I try on a dress I feel _naked_. After years of skirt/top/cardiganorjacket, I feel like I’m in my underwear – not enough layers!I’m planning a full-skirted gorgeousness in indigo fine linen/nylon with a navy silk sash around the waist, and a slinky sheath number with a tab front (less buttonholes! ), maybe in navy, maybe in bright blue. Then again, there’s always black… Re buttons – I just bought the Heirloom Buttons book; some of them would look wonderful down the front of a simple gauzy full-skirted summer shirt dress. The metal ring ones were invented to survive turn-of-the-20thC washing techniques (boiling and wringers).They might take ages to make, but they could be portable if you commute. Hi Erin,I don’t comment very often, but I wanted to let you know that I had a dream about shirt dresses last night. I’m not sure what it means, but it has to be good, right?I can’t wait to see the photos of your dresses. I LOVE SHIRTDRESSES.Sorry, I just need to be super clear. I had two, bright red and kelley green, bought at the thrift store back when I was a bigger size, and eventually had to release them. For some time I was bereft of shirtdresses. I bought a pattern here and there but as you said, it’s a lot of time, an ever-shrinking commodity. And then last weekend: shopping: no pants fit out of 10 pairs. Whatever, because then I happened upon an Anne Taylor “olive brown” shirtdress. I would probably have gone bride-at-a-wedding-gown-sale crazy if necessary for this dress. I jumped up and down in the fitting room for joy over a $40 new dress… then it turned out to be only $20. I left the store in disbelief, but had to return & spent another hour or so combing the racks for another just the same in more colors (or the same color, whatever, I could just wear the same dress day in and day out, right? Different accessories, maybe embellish it?)–none. I did find another shirtdress that’s just a bit more fussy, and we all know shirtdresses should not be fussy! Oddly, the second has pockets, even though the fabric is a sheer-ish cream color, and the first, though fully lined and a deep “breen”, does not. I do not really care. I have two shirtdresses again and I am strongly considering logging off to paw through my patterns and immediately begin a homemade third.I think you and some of your readers may be the rare individuals who can appreciate the happiness of this story. Of course I wore the first, less-fussy dress to work right away and received several compliments. Love your blog!I’m just wondering about that banner on the front of the pattern envelope – what is a “proportioned shirtdress”? A “proportioned” dress is one where they make allowances for short- and long-waisted people, and include three different bodice pieces to make fitting easier.I always think I’m short enough for the short-waisted and I’m always wrong. I’m only about an inch too short-waisted for “regular” bodice lengths, and the short-waisted proportioned dress is about 2 or even 3 inches shorter. i love love the shirtdresses! unfortunately, the waistline finds my love laughable….. oh well, good for the morivation to keep on my ‘making good choices’ not a diet diet.